At 1.5C the proportion of the global population exposed to water stress could be 50% lower than at 2C, [the report] notes. Food scarcity would be less of a problem and hundreds of millions fewer people, particularly in poor countries, would be at risk of climate-related poverty. In a nutshell: between now and 2030, we must take "unprecedented" action in order reduce global CO2 emissions and limit climate change, with extremely dire consequences if we fail to do so. Even if we are to abandon the 1.5 degrees Celsius goal and to aim for no more than two degrees of global warming—which would mean accepting all of the potentially disastrous effects mentioned above—the IPCC report projects this would require a 20% reduction in carbon pollution by the year 2030. Currently, Watts notes, "the world is on course for a disastrous 3C of warming." Obviously, global warming is a problem that must be addressed on a global level. However, given that, according to the Global Carbon Project's 2017 numbers, the United States is the world's second-largest carbon dioxide emitter (behind only China, the single most populous country in the world) and its carbon emissions per capita are significantly higher than those of other advanced countries like Germany, Japan, the Czech Republic and Norway, it's more than fair to say that dealing with the impending climate crisis will require especially major action on the part of the US. This is not the only crisis we may be facing in the near feature. A 2017 report by the McKinsey Global Institute projects that automation may displace as much as one-third of the American workforce by 2030 and further exacerbate income inequality, already a serious problem. It's fair, even advisable, to take these numbers with a grain of salt. But the fact that robots have taken over jobs once done by human beings is indisputable, and there's little reason to think that it won't continue. There's a common thread connecting these problems (and many others): capitalism. It's because of the capitalist economic system—the private ownership and management of businesses—that automation looms over us as a threat rather than promising us freedom from having to do jobs that few people actually want to do, as Alexandria Ocasio-Cortez recently noted. A future where all of the world's dirty, boring and unrewarding jobs are done by machines should be an appealing one: then we're free to enjoy the goods and services those jobs create and, since nobody has to do those ugly but once-necessary tasks anymore, we're all free to spend our time on things we actually enjoy. But, because these labor-saving machines and the companies that own them are themselves owned and managed by a relative few, that small elite enjoys the benefits of automation (higher profits as they save money on labor) while the displaced workers have to search for some other job that hasn't (yet) been automated out of existence. Climate change, too, has a lot to do with capitalism. Certainly, socialism isn't inherently environmentally friendly; it's entirely possible to have worker-owned enterprises that pollute the atmosphere just as much as privately owned companies. But capitalism in its current form makes it especially challenging to deal with climate change. Even as public concern about the impact of climate change grows, the sort of radical action that needs to be taken is unlikely to happen because of fossil fuel lobby's influence over public policy. Many of the measures that need to be taken to adequately address our environmental crisis threaten the profits of major corporations, and would require a bold defiance of these powerful entities. Even if we don't choose to move past capitalism altogether and replace it with a democratically managed economy (which, in my opinion, is desirable for these and many other reasons), it's clear the system as it currently stands will need to be dramatically altered if humankind is to have any sort of decent future. Changes will have to be radical, even unprecedented, and come soon if we're to avoid catastrophe. We are not in a situation were we can continue on our current path, or make a few minor tweaks, or even just a number of moderately significant alterations: if we're to effectively handle the threats facing us, our whole socioeconomic system needs to be straight-up revolutionized. It's in this context that the 2020 presidential election must be seen. We need someone who can help to bring truly extreme and fundamental change to the country and the world if we're to avoid the sort of future that looks like more like a work of dystopian fiction than it does the world we have today (as ugly and radically imperfect as that world already is). The current Democratic field does not inspire a great deal of hope in that respect. The American political system is so corrupt and rancid that the person we really need as president is some wild-eyed radical who'd readily take a sledgehammer to the whole thing and call a new constitutional convention on Day 1—or who'd at least serve as the ringleader of a nationwide mob so wild and unruly that they could mercilessly terrify Congress into passing policies like the Green New Deal and Medicare for All. No one in the field, as far as I'm aware, fits this description. So we're forced to look at the options we do have. Unlike last time, there are actually quite a few options on the Democratic side this time around and I won't pretend I've thoroughly looked over each and every one. I can only speak to the ones that I do know about—rest assured, if Pete Buttigieg or Jay Inslee surges to the top of the polls, I'll be sure to learn more about them and share my thoughts. But out of the candidates currently polling above the low single digits—Joe Biden, Kamala Harris, Bernie Sanders, Beto O'Rourke, Elizabeth Warren, and Cory Booker—Sanders is the one who's the the most willing to challenge (and propose alterations to) the capitalist system. Warren is similar in terms of economic policies but has loudly declared her allegiance to capitalism in a way Sanders hasn't. Realistically, they'd probably be very similar presidents on the economic front (my preference for Sanders relates more to foreign policy, where he's challenged America's support for Israel in ways that Warren often hasn't). But still, Sanders is the only one of them who calls himself a socialist. The point of this post, however, is not specifically to argue in favor of Bernie Sanders—it's more fundamental than that. Sanders' and Warren's supposed radicalism has often been used as an argument against them (even though many of their proposed policies are actually pretty unexceptional when we look at other highly developed countries). We can debate whether either of the two are actually radicals (they aren't, for the record), but the idea that radicalism is undesirable is not only wrong but profoundly dangerous at this point. Rather, we should be demanding radicalism from the Democratic candidates, because we are in a situation where, because of climate change, automation, economic inequality and other issues, radical change is an absolute necessity—not just if we want a better world (though we should, of course, aim for that), but if we want to keep things from getting dramatically, horrifically worse. If the Democratic candidate for president wins the 2020 election, they will take office in 2021 and (unless they die, resign or are removed from office) serve at least until 2025. That leaves just five years before 2030—the IPCC's deadline for reducing carbon dioxide emissions by 45 percent, and the year by which McKinsey Global Institute estimates up to a third of the workforce may have been displaced by automation. If radical change isn't under way at that point, it's a safe bet that we are in some serious trouble. Furthermore, there's a good chance that if the Democrat wins in 2020, that same Democrat (whoever it turns out to be) will be the party's candidate in 2024 (in all likelihood, if they choose to run for reelection they will get their party's nomination). So if we elect, say, President Beto O'Rourke in 2020, our choice in 2024 will in all likelihood be between Beto and whatever lunatic the Republicans nominate, and whoever wins that election will be in power at least until 2029—just one year before our big deadline. Eight years of moderate Democratic rule will not bring the changes that we need to avert catastrophe, and four years of moderate Democratic rule followed by four years of Republican rule would be even worse. And if major changes aren't underway by 2029, it's pretty much game over. We're facing steep odds even if we elect a Sanders or a Warren in 2020, given that Congress will still be full of Republicans and establishment Democrats who balk at the sort of "extremist" policies that are desperately needed. But those odds shrink even further if we elect a "moderate" (or re-elect Trump). 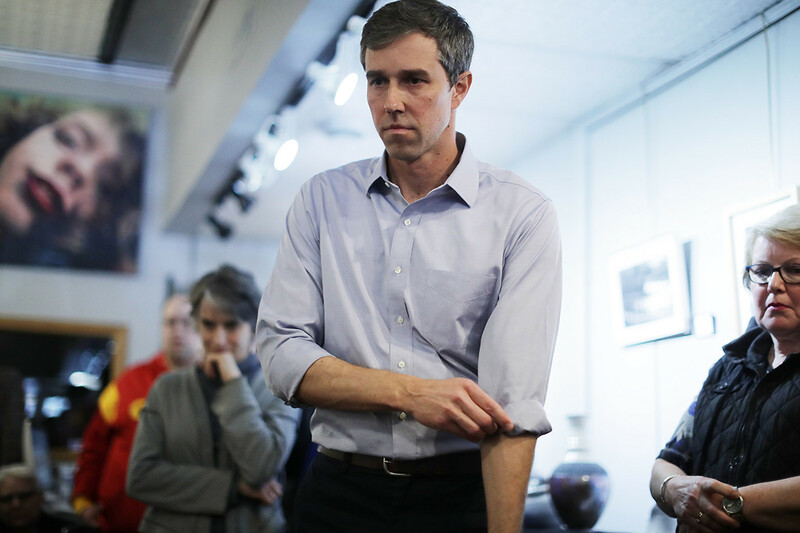 Beto O'Rourke, who just entered the race and boasts the biggest first-day fundraising haul of any candidate so far, is at least doing us the favor of being openly moderate (and his voting record in Congress confirms that, despite being from a reasonably liberal district, he has often been to the right of the even the majority of his fellow House Democrats). While Joe Biden has (ludicrously) claimed he has "the most progressive voting record of...anybody who would run," this is plainly false and he is perhaps the single most conservative (potential) candidate for president on the Democratic side. Others in the field—Cory Booker, Kamala Harris, Kirsten Gillibrand—have offered some (largely symbolic or rhetorical) support for policies like the Green New Deal and Medicare for All, but there are real reasons to doubt this would actually translate meaningfully into policy if one of them won the presidency. It's understandable why, after a few years of the deranged Trump spectacle, left-leaning people might just want some kind of return to the status quo ante Trump. It's also extremely dangerous, given the circumstances. This is not an election where we can afford to vote for candidates on the basis that they're unifying or inspiring or cool or "presidential." The only sane criteria is who will be most willing and able to implement fundamental changes to try to avoid the worst.